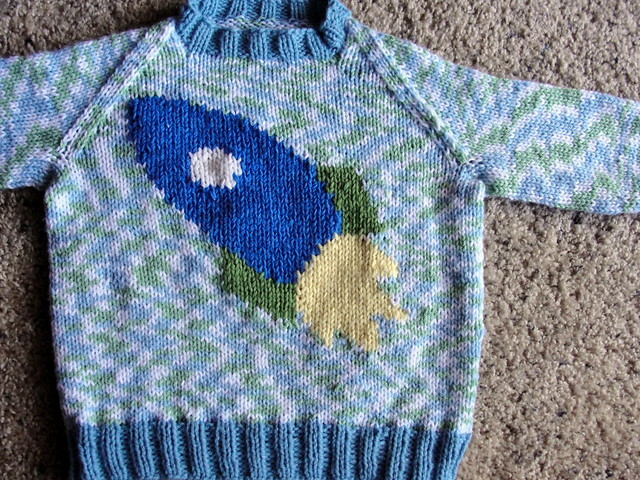 All done with the sweater that I blogged about earlier here and here and it's a perfect fit. I'm glad I did all the ripping and re-knitting because it's perfect. I'll share the pattern as soon as I can write it down in pattern lingo. My 3yr old looks pretty comfy with it. 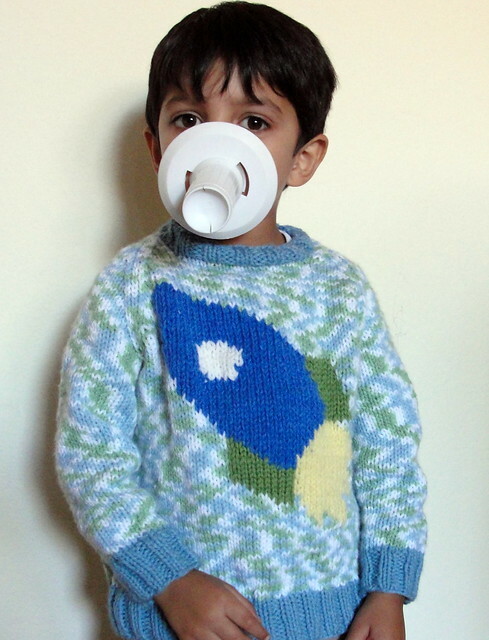 However for all his eagerness and impatience while I was knitting it, he was hardly interested when it was done. I think he just likes the fact that he got to pick the motif for his sweater, not to mention the sense of power he got when he could check on me if his sweater was done. He also loves to play with the loose ends of yarn that are lying around when I'm knitting something and my plastic stitch markers and the ball winder. 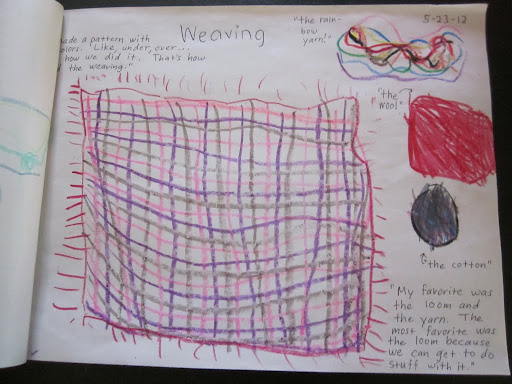 This reminds me of when I went to his school to talk about yarn and knitting and weaving. I carried a couple of kids' weaving kits that I'd bought at Michaels. 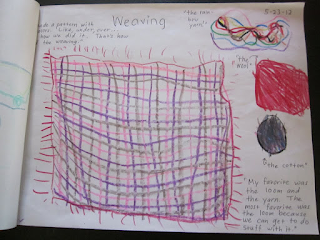 And though the children did enjoy the weaving, I think they would have liked it more to just play with the little bands of colorful yarn that came with the weaving kit. I'd also carried a ton of different kinds of yarn from my stash and store. Silk, wool, cotton, acrylic, un-dyed, dyed. The biggest oohs and aahs were for the colorful variegated ones. They made me a little thank you book with pictures they drew of the session. I was so touched! I wish I could share all the pictures but here's one to give you an idea. And here's one of the little hands weaving! I feel proud of you!!! Enjoy what you are doing.